i want to use a cloud to host 2 Xamarin apps so what is the best cloud regardless of azure? So, how can push pages to Detail from Mvvm? You need to define BindingContext for the page, and use code-behind navigation. Or use any Mvvm framework for this. I need to open my Slack application installed on my cell phone through a button created in Xamarin Forms. What I have is an interface created in the shared project and the clicked event of the button in "MainPage". Later I have created a class in the project.android which makes a dependency injection to create an implementation to open a specific application by means of "Intent"
But I can not find a way to open Slack's application. Is there any I "Intent" from Slack? I can't use OutputStream or any other kind of stream, yet I can't create an instance of System.IO.Stream. Any solutions? I can't write an image to the storage in that way.. 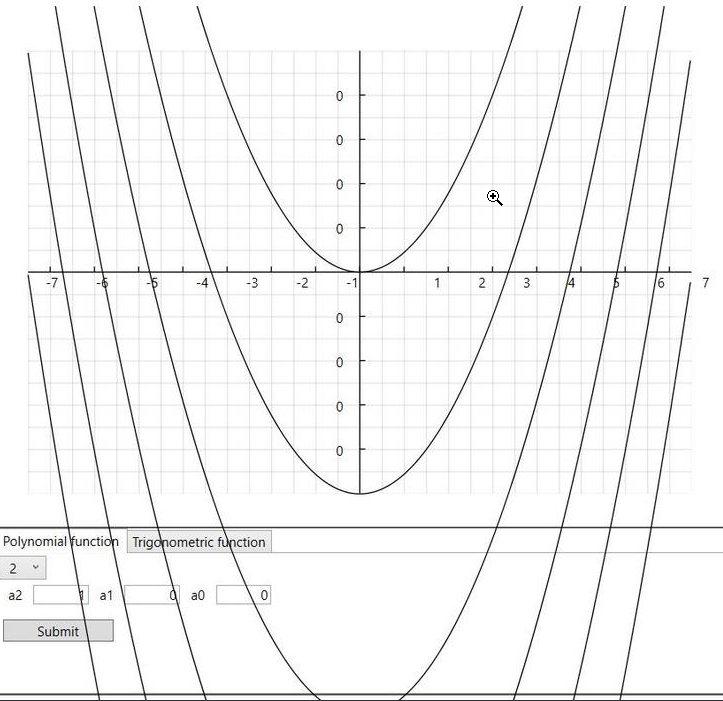 I need to develop a function plotter where the user can enter up to 10 different polynomial or trigonometrical functions. 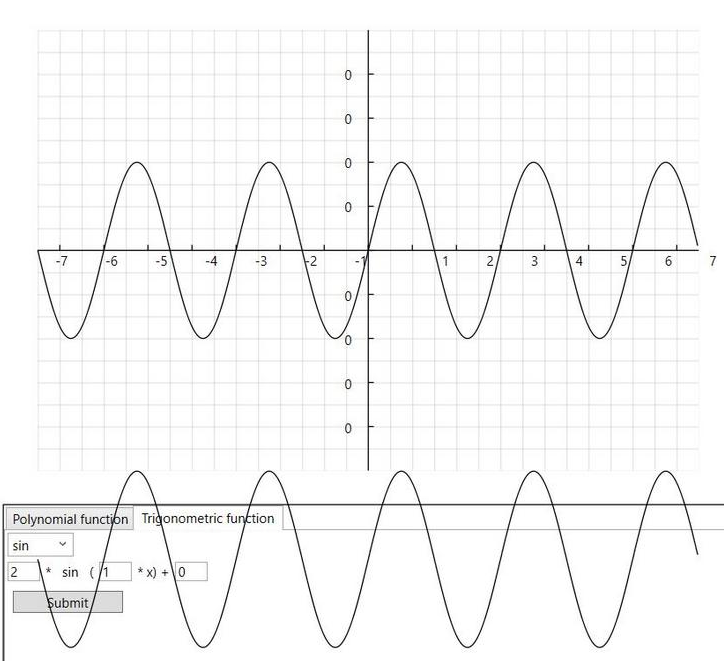 Each function is represented by a polyline and is drawn on a canvas. All the functions are stored in an observable collection of functions. However, if I keep adding more and more functions, they don't show up at the right place. In the following pictures I tried to add the same function over and over again but it keeps placing them on the bottom of each other. The items of Items collection in SubViewModel class are always from the same type (Vector3DViewModel / Vector2DViewModel). However Data collection can hold subViewModel items that contains collection with items of type Vector3DViewModel and items that contains collection with items of type Vector2DViewModel. return Items.Contains(vector, myComparer)) //comparer based on view model type, which one to instantiate? I really want to avoid type checking in the SubViewModel class. Is there any way to solve this (even if the whole relations between the objects should be changed)? I have an Activity, in which I'm providing viewModel throw ViewModelFactory. All my acritecture was created folowing by https://github.com/googlesamples/android-architecture-components. All works just fine, but when I'm trying to go to splitscreen, my activity passes me in on create new instance of my ViewModel. But when I'm closing splitscreen and going to normal mode, my activity returns previous exam of my ViewModel. Where can be a problem? I am developing a multiplatform application with xamarin forms and I need to connect from a cell phone to a linux device by means of bluetooth, when doing the tests on an IO device I have had no problems but when using an android device it is not able to connect with the linux, As I read most plugins have the limitation of connection between devices with the same operating system. But I have not found how to solve this, or what I can do to achieve the connection. There is another library xamarin QR reader apart from zxing c # Xamarin. zxing is not optimal for my project does not read fast, real QR code does not read them with zxing.